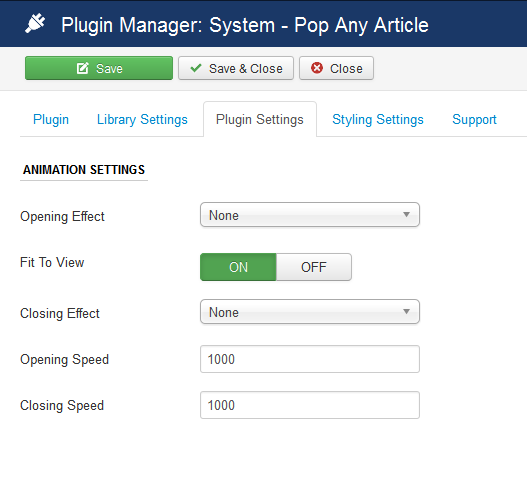 Pop any Article installation, capabilities, features and options. Note: This documentation applies to Version 2.1 and above only. After downloading the PopAnyArticle_UNZIP.zip file, UNZIP it. You will be able to see a Documentation folder and two different version of the extensions, one is for Joomla 2.5.x and the other for 3.x. Choose the correct file to install. Installtion of incorrect file may give you errors. Click on browse to choose the correct installation file and click on "Upload and Install"
After installation go to Extensions > Plugin Manager. On the Search Bar type System - Pop Any Article.Now click on the System - Pop any Article to configure the plugin. Upon clicking you will be able to see the following with default "Plugin" Tab opened. Include jQuery File : Incase you see that the link and the image for the popup shows up on the frontend but when you click on it the popup doesn't appear, then try to change it to body instead of head. Article Title Inside Popup : Set it to Show if you would like to show the title on the top of the Joomla article inside the popup. Font Awesome : Set it to Yes if you want to use icons for text and images for the buttons or image overlay. You can also set it to No if font awesome is already loading into your website though your template or any other extension that you are using. You can check it by going to the source code in browser and searching for the word "font-awesome". Opening Effect : The effect in which the popup will appear/open/show when the image or text is clicked. We have 3 effects : None, Fade and Elastic. Closing Effect : The effect in which the popup will disappear/close/hide when the image or text is clicked. We have 3 effects : None, Fade and Elastic. Opening Speed The time in milliseconds which will take the popup to show. Closing Speed The time in milliseconds which will take the popup to hide. Fit to View When set to ON the popup will be responsive and fit to tablets and mobile devices. The popup styling will remain same for all the pop any article popups that you will have in the website. You can't have different popup styling in a single website. 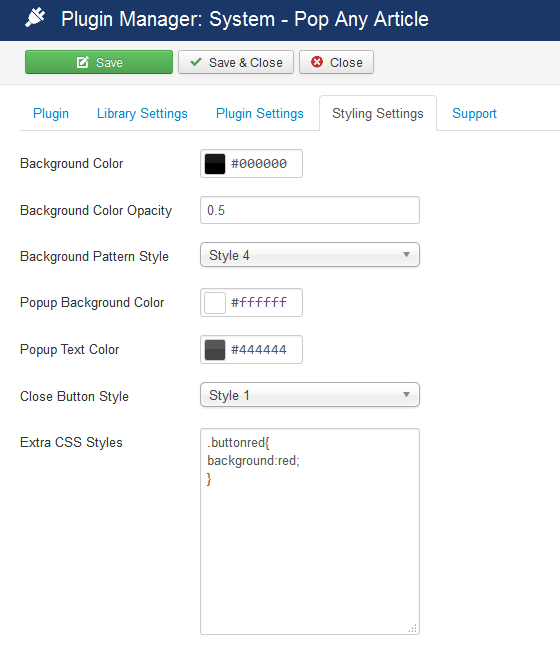 Extra CSS Styles: Define the extra CSS styles you would like to add for the plugin. You can add the plugin shortcode inside any joomla article, modules or components depending upon your requirements. 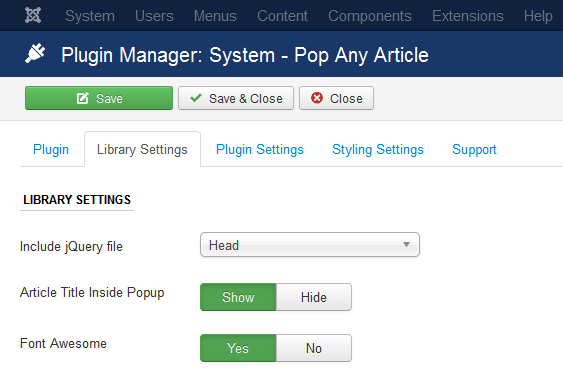 Using the plugin you can popup a joomla article upon clicking a text or an image. The text you would like to click for the popup to appear. This is a mandatory option which has to be added into the shortcode. 285 is the Joomla artcile which will popup when text or image is clicked.How to know joomla article Id? The maximum width for the popup. The default width will be set to 500px if you don't add the option into the shortcode. The maximum height for the popup. The default height will be set to 500px if you don't add the option into the shortcode. The image you would like to click for the popup to appear. The alternative text for the image. Add it for best SEO results. The text you would like to show for image overlay. The background color you would like to have for image overlay. The font size of overlay text. The thickness of border you would like to have around the overlay text. The default it 0.
class="imgmargin-10" You can assign your own class or any of our predefined class. How to add font awesome icons to buttons and images? Go to the font awesome website (Font Awesome) and choose the icon you would like to display. For example if you are looking for a info icon, then get the class for it by clicking on it. icon="fa-info" has to be added into the plugin syntax to show info icon. How to write shortcode faster? Copy the shortcode directly that you wish to add into your website from the examples above and set the values as per your requirements. We added all the examples above. Other than the above examples not other requirements can be fulfilled by the plugin. How to get article id of a joomla article? Go to the menu Content > Article Manager where you will find the article listed. 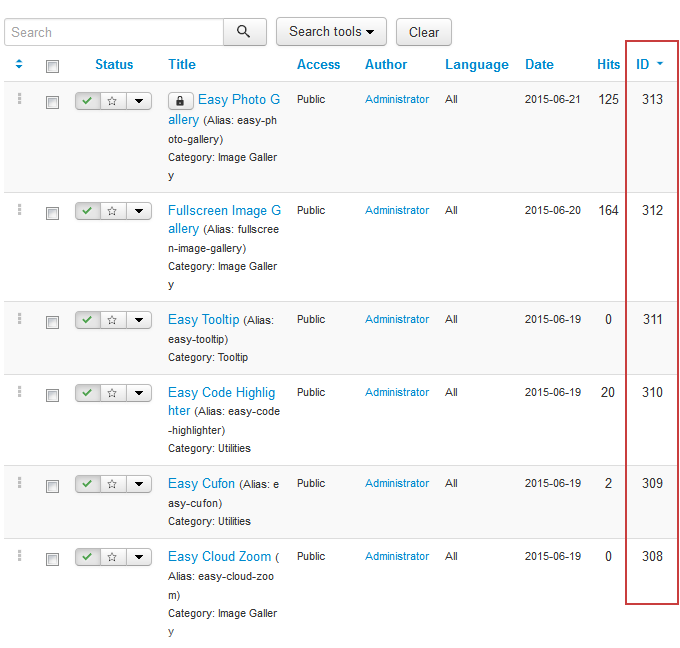 The right most column is the article id for a joomla article.